Kayotsarg means to give up one's physical comfort and body movements, thus staying steady, either in a standing or any other posture, and concentrating upon the true nature of the soul as being separate from the body. Kayotsarg literally means abandonment of body, thoughts and mind and get absorbed only in the conscious self. It also means self-awareness by complete relaxation and inactivity. Normally the practitioner takes a comfortable posture either lying down or sitting or standing and breathes calmly. Then self suggest each and every part and entity of the body to be relaxed and feel the same. Once the body is completely relaxed, the practitioner practices to realize separate existence of soul from body and then forget about the body and practices to identify the Self. Then one practices of complete awareness of the self without any hindrance. Kayotsarg can be practiced in standing, sitting or lying down posture. Essential thing is to maintain the immobility of the body. A standing meditative posture was more common in olden days. A posture, easy to follow but difficult to practice. It is also called ‘urdhva Kayotsarg’. Kayotsarg or body abandonment posture. Standing like this, completely immobile with arms hanging free from the body, was considered a form of severe penance. It also shows that they were following the doctrine of ahimsa or non-violence, since by keeping still they could not harm any creatures, even accidentally. In ancient times, the method of practicing Kayotsarg comprised of bodily relaxation. Practicing Kayotsarg with an awareness of inbreathing and out-breathing results in greater concentration and relaxation. Concentration is essential for practicing Kayotsarg, even though, Kayotsarg in itself is an exercise for increasing concentration. Synchronized with respiration, Kayotsarg becomes even more effective. Kayotsarg means 'rising above the body'. As one transcends the body, there is a falling off in the consciousness of outer phenomena. That is the right occasion for practicing anupreksha (contemplation) or auto-suggestion. As long as the conscious mind is active and gross consciousness operates, the practice of contemplation or autosuggestion is not wholly effective. But when a human goes deep into him/herself, a new event transpires. Kayotsarg is typical to Jin spirituality. Historically, evidence of the same has been found even amongst the Indus Valley Civilization. Prof. Ram Prasad Chanda, who supervised Indus Valley Civilization excavations, states in his article Mohenjo-Daro: Sindh 5000 Years Ago in Modern Review (August, 1932) that, “Not only the seated deities on some of the Indus seals are in Yoga posture and bear witness to the prevalence of Yoga in the Indus Valley Civilization in that remote age, the standing deities on the seals also show Kayotsarg (a standing or sitting posture of meditation) position. The Kayotsarg posture is peculiarly Jain. It is a posture not of sitting but of standing. 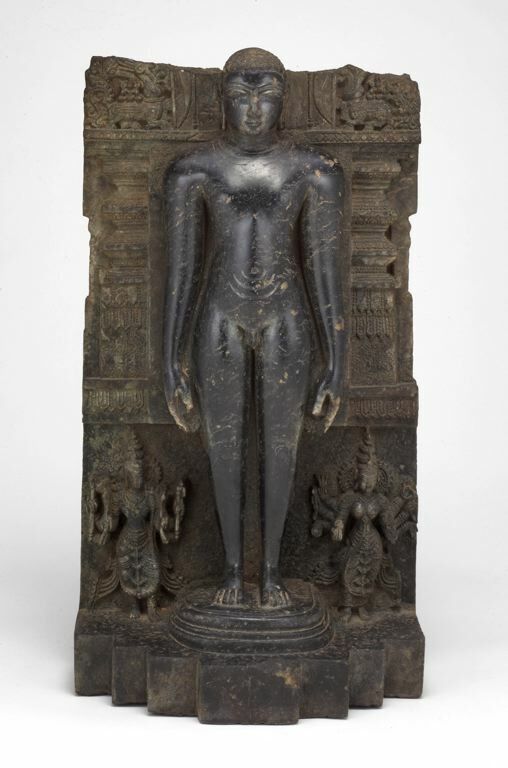 In the Adi Purana Book XV III, the Kayotsarg posture is described in connection with the penance of Rishabha, also known as Vrsabha. Majority of the Jin followers of ancient world preferred to meditate in a standing posture. It was an exercise that required training, practice, and willpower. 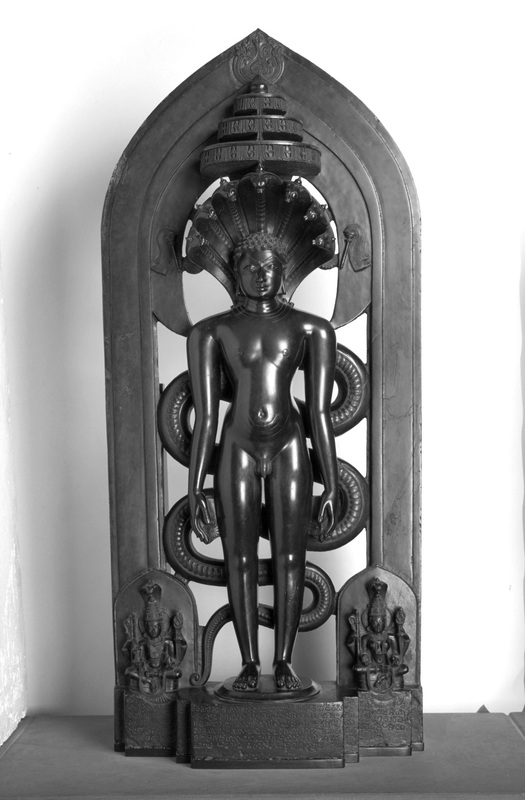 According to Hemchandra’s Yogshastra, provides one of the earliest lists of actual Yoga pose’s, all of which entail asana in the literal sense of sitting or standing: paryankasana, virasana, vajrasana, abjasana, bhadrasana, dandasana, utkatikasana, godohikasana, and Kayotsargasana. Kayotsarg, the last listed pose, carries a twofold distinction. First, it describes that the arms need to hang down (pramlambitabhujadvandam) and that one needs to stand in an attitude of equanimity toward the body (stanam kayanapeksam). 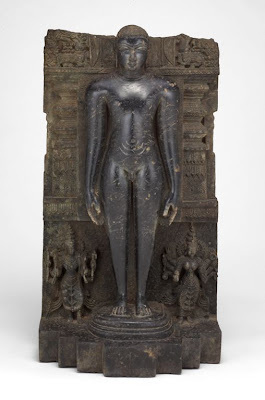 Second, this pose, like the practice of the five vows, is said to deliver one into a state of bodily control: When the body of an ascetic remains immobile as he dwells in the posture called ‘abandoning the body’ (Kayotsarg)…this is said to be control of the body. Hemachandra gives considerable attention to the five breaths, specifying their location and color. He also relates the breaths to the elements. For Hemachandra, the mind and breath cannot be separated: Where the mind is there is the breath, and where the breath is there the mind is. Accordingly, they both have the same activity, mixed like milk and water. If the practitioner of Yoga controls the breath, the mind comes under control, which is the key to liberation: When one of the two ceases to function, the other also ceases. When is active, the other is also active. When both activities stop, liberation results on account of the cessation of sensory impressions. The centrality of breath in releasing one from discomfort and dissatisfaction (duhkh) cannot be overstated. The Yogshastra describes a mind-body continuum involving ethics, postures, breathing, and meditation. The Yogshastra describes the physical placement of lips, eyes, teeth, and countenance during meditation, and specifies that the meditator should face either east or north. To practice standing meditative pose, choose a place where you are least disturbed. Stand still; initially you may take the support of a wall or pillar. Once you are used to standing without any movement you may not require any support at all. Next relax completely. Stand still! It will take a lot of practice to be still without any internal or external movement or wanting to move. When you are still physically, your internal body equilibrium may not be still. This too needs to be made still and only practice can make your body go absolutely immobile internally as well externally. Once this motionless form is achieved, you should not feel your body. The only aspect of awareness will be your mind, your breath. The next aspect is to concentrate on breathing, pick any form that you are most comfortable with and get it into a rhythm. Ease your breathing and relax your body to the level that you do not feel it. Let go off all thoughts and even awareness. Once that is achieved, start concentrating on pure meditation. This is a start, when it is accomplished, aim for deeper form of meditation while standing.